Coming from the businsess world where he built a career in marketing, Nabil Costa joined the non-for-profit sector in 1998 when he accepted the position of Executive Director for the Lebanese Society for Educational and Social Development. In parallel, and since March 2006, Nabil serves as General Secretary for the Association of Evangelical Schools in Lebanon (AESL) pursuing new avenues, and networking with highly credible educational institutions such as the Consortium for Global Education (CGE), Samford University, and others with the purpose of enhancing education possibilities for the graduating students of member schools of the Association. On the global level, Nabil served as Vice President for the Baptist World Alliance (BWA) between 2010 and 2015. 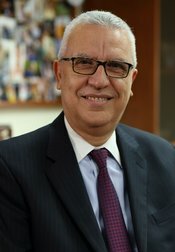 Backed with a Bachelors of Arts in Business Administration and Economics from the American University of Beirut, and a Masters of Arts in Education and Counseling from the Haigazian University in Beirut, Nabil Costa has succeeded in bringing together best practices from the business field into the field of education. In recognition of his contributions, in May 2011 Samford University (AL, USA) awarded Nabil Costa a Doctorate in Humane Letters degree.